Alright, this is not my project, but it was inspired by one of my past projects. 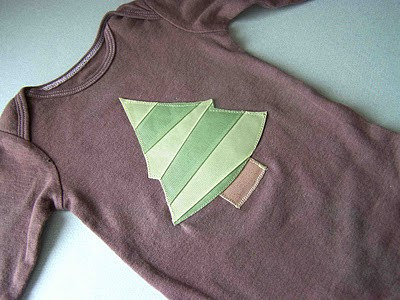 I had high hopes of getting around to making some St. Patricks Day shirts for the boys, but it simply hasn't happened. So I'll share someone else's instead. 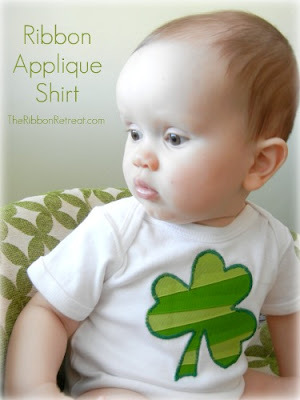 While on pinterest yesterday, I saw that someone had pinned this cute little shamrock onesie. I thought that the technique looked familiar, so I jumped to the source to see if they mentioned my blog or linked back. Fortunately they did. I love finding things online that were inspired by my projects, especially when they link back. Do you remember my Layered Ribbon Christmas Tree Onesie? Well, if you don't you can go and check it out. The shamrock onesie is from the Ribbon Retreat blog. The funny thing is, that I actually purchased all of the ribbon from my Christmas Tree Onesie at the Ribbon Retreat. Which reminds me, I need to add them to my favorites page.